With three excellent actors seemingly bringing their A-game, the only trinity found while watching Red Lights is a confusing, messy and poorly written tedium. A team of paranormal investigators who study mediums to debunk them as frauds take on a renowned psychic who appears to channel real supernatural powers. Cillian Murphy, Sigourney Weaver and Robert De Niro star. I’m sad to say that I had wanted to see this in the cinema, in fact I only missed it by a few days, but thankfully I never did. While the stars involved are excellent (I may be biased, they are three of my favourites all in one place!) the script and screenplay is phenomenally poor. Immediately we are accosted by some of the laziest exposition writing I’ve heard in a long while, to the degree that actors arrive into a scene and dump a huge pile of inhuman dialogue (this is my belief system, these are my failings, etc). The film continues from here without a real sense of identity; is this an investigative thriller, is this a paranormal and supernatural horror? When it appears to settle on one, its script becomes impenetrable jargon… perhaps I was nodding off, but I barely knew what was going on due to the existential crisis that was happening before my eyes. Its ending reminded me of the other disappointing film The Number 23; with the film so unrelentingly nebulous and unexplained the so-called “twist” doesn’t come off as surprising at all! Such utter uncontrolled madness means only a mad resolution would do. 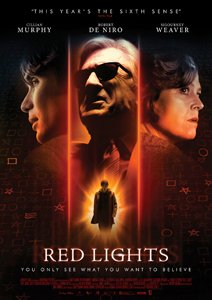 The only mystery that holds in the viewers mind while watching Red Lights is how the director (Rodrigo Cortes – director of the remarkable Buried) convinced these three talented actors to sign up with such a script! Like I say, the actors give it their best shot, I didn’t feel unconvinced by any of them except for the fact I had no idea what was happening to them. Unless you really, really, really like any or all three of them, I’d probably tell you to give Red Lights a miss. “You only see what you want to believe”? I guess I only want to believe that you have no idea what you are doing.